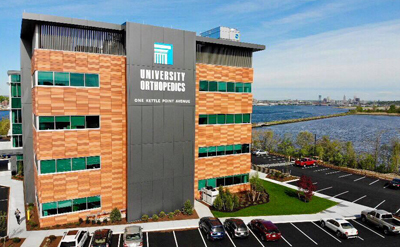 The spine specialists at University Orthopedics in Providence, Rhode Island are dedicated to providing a high level of care for patients with neck pain, back pain, low back pain, sciatica, myelopathy and other spine conditions. Persistent pain - If pain limited to the low back or neck area does not begin to subside after three days with anti-inflammatories and rest, then you probably need to be evaluated by a spine specialist. For example, if you first noticed back or neck pain on Monday, and it is now Thursday, and the pain is not getting better, it is time to see a spine specialist to find out what is causing your problem.Anytime you experience loss of control of your bowel or bladder, that is an EMERGENCY signal that you need to see a spine specialist THE SAME DAY. If you wait too long, you could suffer permanent paralysis of the nerves that control these functions. Foot drop - If you notice that your toe is dragging as you walk, this is a DANGER SIGNAL for serious neurological problems. Again, if you delay, you could experience permanent damage. This problem should be seen within 24 hours by a spine specialist.Weakness, numbness or pain that extends below a knee or elbow is a serious symptom. Go to a spine center within two days.